And here's why: When you're working on an LRGB image set, many frequently stack the images channel by channel, and then combine the RGB to chrominance and L to luminance. In doing so, you're throwing away good luminance data. With most of the LRGB filter sets the Red, Green and Blue filters cover combined nearly the exact bandwidth of the Luminance filter. 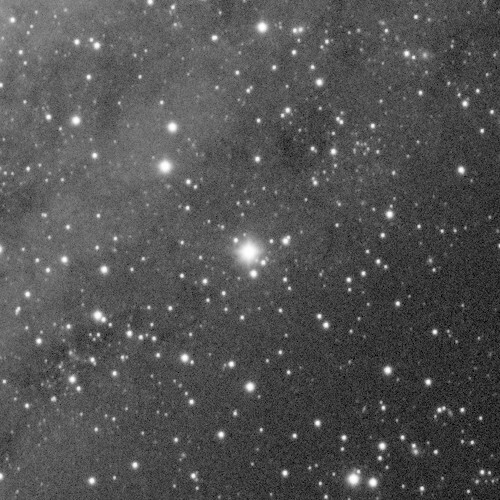 So exposing the same duration at same binning on all filters means I can sum each RGB sequence to an additional L frame, and I've "wasted" only two frames' worth of exposure time from luminance data. If I shot the RGB with a higher binning and different exposure, all that time would be wasted from luminance and my color channels would be crappier due to worse spatial resolution. Binning your color channels is beneficial only when you have really dark skies and the sky noise doesn't drown out the read-noise with any sensible exposure durations. If your luminance exposures are easily longer than sky limited color channels at 1x1 binning, you are wasting time and resolution by binning the colors. There's no need to expose at the shortest possible sky-limited times, it should be considered the minimum exposure time, and the maximum exposure time is set by saturation of your target on sensor. As a case study, below are two full-resolution crops of the same spot in my M31 mosaic showing the difference. The mosaic is a 2 by 2 panels, each panel is made from 10 minute exposures, 6 for L and 5 for RGB each. Stack of same 6 luminance frames and 5RGB-sums. As you can see, the stack of only L frames is a fair bit noisier, and it has a faint satelite streak going thru as there wasn't enough data to weed out all traces of it. For the lower image, each RGB-set was summed as a synthetic luminance frame, and these 11 luminance frames were stacked for the final image. Some care must be take of course, don't normalize your RGB frames when calibrating, that could throw you data a bit off. Some image processing (like PixInsight) allow you to weight the combination based on noise modelling. This does seem to return a decent approximate of a sum, if you have normalized the color frames during calibration.